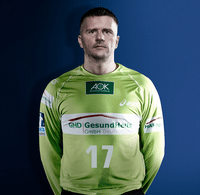 The best goalkeeper of Bosnia and Herzegovina in the last decade, Enid Tahirovic (40) has finished proffesional career with the last match for Frisch Auf Goppingen in Lemgo (22:25). Experienced goalkeeper came in Bundesliga in 2008 and played for FA Goppingen,but also he spent this Autumn in HSV Handball. Before German experience, he was a member of Slovenian Cimos Koper and Bosna Sarajevo. Tahirovic’s career example is something unusual in proffesional sports. He was unknown goalkeeper almost until age of 30, when he went back to Sarajevo and began to play for Zeleznicar Sarajevo (2000-2003). 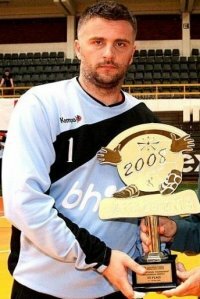 In just a few years with Bosna Sarajevo (2003-2007), Tahirovic became the most important handball player in domestic League, but also one of the most known athlete in whole country. – I want to express my gratitude to all the people who followed my career all these years. There were a lot of beautiful moments, of course, some others, but after all I hope that I didn’t dissapoint you – Thank you” – wrote Enid on his FB profile. ← Previous Story Flensburg smash Kiel in “eternal derby”! Next Story → Alexander Petersson to miss WCh 2013 – Olafur is back!